I wore the grey spinel today (more pics below!) 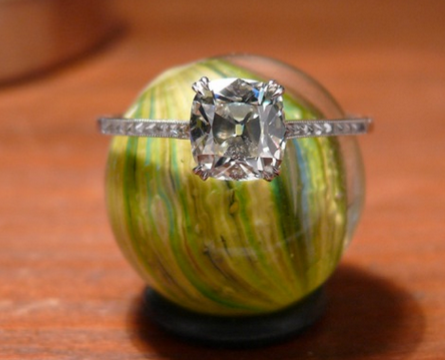 it was sourced and designed through Elle at the gemstone project. I love that it’s just a little bit different! The Malaya garnet is 2.91ct, approx 9.1mm x 7.6mm, it has a bit of a colour shift which keeps it interesting! Good eye with the topaz! Yes it’s a concave cut from Richard homer with a custom design by Carla Maxine (Australian designer), it’s a bit more of a dinner/cocktail ring! Beautiful!! And the pink sapphires are such a perfect pink ! I'd love to contribute to this thread but all my rings are at the bank at the moment. *sniff sniff* So old, random pictures will have to do for now - hope you understand! snotty_pie, Sparkle_ruckle, strawrose and 16 others like this. Wow, these are seriously stunning! I'm glad you finally posted here. Your spinel settings are unique, and I love the loopy underside gallery detail on your paraiba ring, which is, of course, a classic. Did David Klass do all of these? I'm wondering who designed the red spinel setting. Thank you so much, @voce. I really appreciate your kind words. Yes, David has done all of these rings. I enjoy working with him. I worked with Elle (from The Gemstone Project) on the red spinel ring (and several others). I brought my inspiration piece to her and we went from there. It was a long and fun process that was completely worth it. lovedogs and voce like this. Here are my top 5 rings! Tanzanite, tourmalines and blue zircon. AV_, suzanne2, LisaRN and 11 others like this. Eady and SparkliesLuver like this. Awwww, @lovedogs! <hugs> I must say, three of my five rings are spinels, so which one in particular are you referring to? The red spinel? It means so much to hear a gem lover like you, @Rare gem lover, say such kind things. Thank you so much. I'm sure you will - just take your time and you'll find the right one! I've also found that the key is reaching out to vendors you know and trust so they know you're looking. That way they might let you know of something before they post it online. MissyBeaucoup, Hivona, Rare gem lover and 1 other person like this. You know I love each and every one of your rings. Such gorgeous and saturated pieces! That paraiba ring is, of course, my favorite but that red spinel ring is so fun and interesting to look at. I bet you stare at it all day while wearing it. LisaRN, SparkliesLuver and lovedogs like this. You guys are making me blush with all your super kind comments. Thank you, @elle_71125. <hugs> I remember asking myself, upon starting that ring, is this what I really want to do with it? Cause it's different and not for everyone. And without hesitation I answered "yes!" That's when I knew I had to see my vision through...just like my paraiba ring with the double halo. I do stare at my rings when I wear them, sometimes even missing out on conversation/things around me. MissyBeaucoup, voce and elle_71125 like this. LisaRN, Bluegemz, leslie1956 and 5 others like this. My sapphire e-ring was my first CS and so even though it’s one of those dark inky blues, it’ll always be beautiful to me. Sirenagirl, LisaRN, USCgal and 11 others like this. I’m really loving all the green stones on this page today! What beautiful settings you found for them! My prettiest 5 have changed since receiving my aquamarine and chrysoberyl. Hivona, Sparkle_ruckle, NKOTB and 8 others like this. Any (adjusted) list of 5 favourite CS rings to share? This thread has some breathtaking pieces, but this piece reminds me of one of my all time favorite rings, “The Rockefeller Sapphire” (another Burmese sapphire in an Art Deco ring). Your ring is a gorgeous Art Deco piece! diamondsareagirls, Acinom and Rare gem lover like this. MissyBeaucoup, AceofHearts, caf and 11 others like this. I’m usually over on RT and don’t have any CS myself (yet!) but I just wanted to say that all your rings are very beautiful and this was a really nice thread to read through! MissyBeaucoup, strawrose, hmr_mama and 2 others like this. These are my current favorites! voce, MissyBeaucoup, caf and 9 others like this. Gorgeous collection! You have a preference for cooler colours? Beautiful!!! Thank you! Yes I definitely prefer cool tones!! Give me all the blues, purples and greens!! I desperately want to add a paraiba to my collection as I’ve been drooling over all of them in this forum!! MissyBeaucoup, leslie1956 and Acinom like this. Everyone has such amazing stones and settings . Gemfix sapphire purchased from LoupeTroop and set in a leejewlery setting. Prima Gems Mahenge Spinel set in an Aurosi Jewels setting. Jerry Newman Tourmaline purchased from LoupeTroop in a setting by my local jeweler. Prima Gems purple garnet in a leejewelry setting. Westview Gems zircon in a jewelryhoo2 setting. Burmesedaze, lovedogs, MissyBeaucoup and 15 others like this. Dang girl, these are some freaking colors! I love each and every one and I’m especially in love with the mahenge spinel setting...so delicate and feminine. 2Neezers and MissyBeaucoup like this. I have a pretty simple style and wasn’t sure how I would feel about the pink Mahenge spinel in the femine halo once it was set, but I love it! I’m glad I tried something outside of my comfort zone. I think it might even be my favorite ring right now . MissyBeaucoup, elle_71125, voce and 1 other person like this.